It takes different forms for each of us and arrives at different times – but the “moment” occurs. A moment that leaves you speechless. A moment that leaves you heart broken. A moment that rocks you. 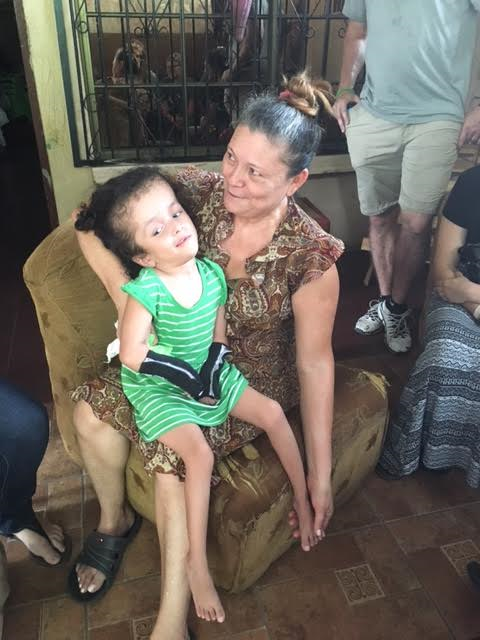 Today I went with one of our groups to visit a family that is supported by our ministry partner, Tesoros de Dios. On our visit, we met this family. As you can see in the picture, Guadalupe is holding her daughter Maria. And although I can spend considerable time talking about the numerous health issues for Maria – that is not what caused the “moment” for me today. You see Guadalupe is not Maria’s biological mom. Her “real” mom abandoned her at the hospital (with broken arms, legs, and pelvis) when she was about a year old. I guess she couldn’t handle the medical issues her special needs daughter had. Guadalupe found her at the hospital and has raised her as her own daughter ever since…over 7 years now. Why would she do this? Why would she alter the course of her own life to pick up a special needs baby that had in essence been thrown in the trash. Why? Because that’s what love requires. You see when we encounter something that breaks our heart we can either ignore it or do something. Love requires us to act. And when we do it will cost us. Because that’s what loved required.